The worst escalation of hostilities between India and Pakistan since 1971 opened a new geopolitical threat on Wednesday, prompting traders to sell off global stocks and buy up safe-haven assets such as the and U.S. Treasurys. 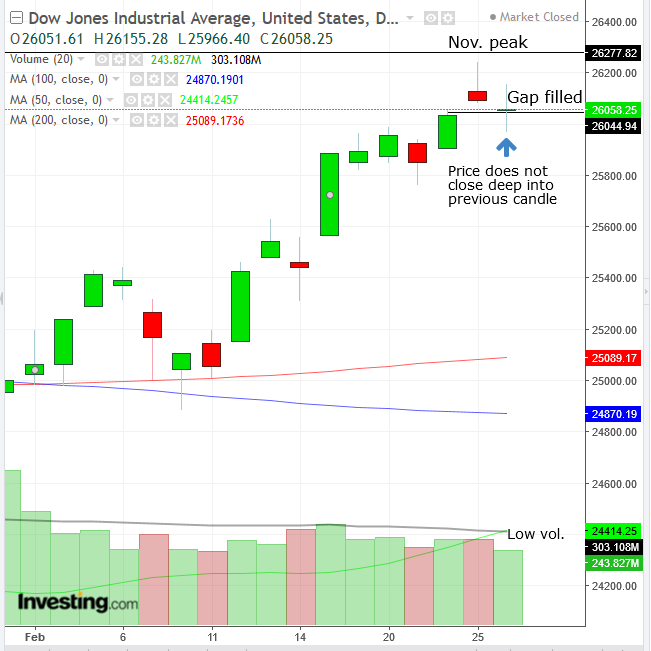 The wiped out half of Tuesday’s gains with a falling gap. It then extended losses and erased Monday’s gains as well. Futures on the , and were also flashing red. Earlier, in the Asian session, stocks dropped off their highs after Pakistan announced it shot down two Indian jets in retaliation for an alleged airstrike over the disputed Kashmir border. Islamabad also reported it arrested an Indian pilot, setting the stage for a dangerous conflict between the two nuclear powers. China’s still managed to close 0.42% higher, though it gave up a 1.9% intraday high that would have erased Tuesday’s losses and strengthened Monday’s 5.6% percent surge. Earlier gains would have also closed above yesterday’s intraday highs. Hong Kong’s extended its drop to the third straight day, slipping 0.05%, while Japan’s climbed 0.5%. 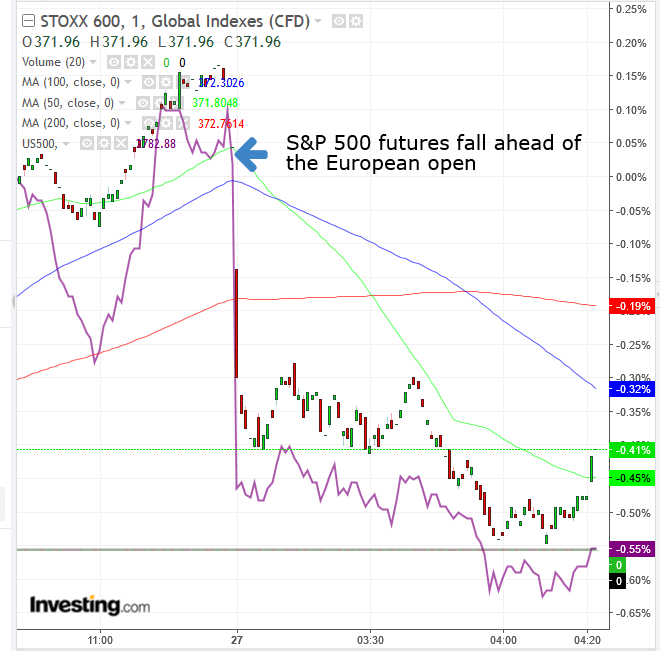 In yesterday’s U.S. session, equities edged lower in the final hour of trading but still managed to seal some gains after rebounding from a lower open. The downturn followed Fed Chair ‘s testimony to the Senate Banking Committee, during which he warned there have been “conflicting signals” on growth over the last few months. Powell’s statements are in line with our repeated warnings, over the same time period, of conflicting intermarket and technical signals—chief among them the upbeat performance of small-cap stocks and the strengthening of ‘s and Treasurys’ safe-haven edge against a backdrop of higher prospects for a U.S.-China trade resolution, and of correlated growing risk-on appetite. Presumably, reassurance from the country’s No.1 policymaker that the central bank is in “no rush to make a judgement” about interest rates has recently protected the market from a substantial selloff. Even before the Powell-driven end-of-session selloff, price gains were capped at the 2,800 psychological milestone on Tuesday. The closed 0.08% in the red after stopping out traders, as it oscillated between gains and losses. It is noteworthy that (-0.57%) shares lagged, nearly erasing Monday’s 0.65% gains—which had been helped by U.S. President Donald Trump’s signalling higher tariffs on $200 billion worth of Chinese goods would be postponed. We suspect investor focus is wavering unsteadily between monetary policy and U.S.-Sino jitters. There was no downward gap. While prices opened lower, the gap was filled on an intraday basis. The price didn’t penetrate deeply into Monday’s real body. Volume thinned instead of jumping on the price drop. Therefore, while the shooting star was bearish after an advance—especially when coinciding with a pre-existent resistance—there was no evening star, which would have carried a yet more bearish implication. Perhaps Powell’s recent dovish tone fed speculation that the Fed was reversing its tightening path, and thereby prevented a deeper selloff—though that’s just one hypothesis. The only gave up 0.07%, outperforming its peers. The was the day’s laggard, shedding 0.43%. While that’s what we’d expect to happen when the outlook for a trade resolution improves, it does not jibe with the lackluster performance of Materials stocks. The Dow’s ranking as the second-worst performer also clashes with the narrative that U.S.-China trade is currently the most prominent market driver. The first part of Powell’s testimony to Congress also moved the yield on Treasurys, which dropped below a triangle on Tuesday. 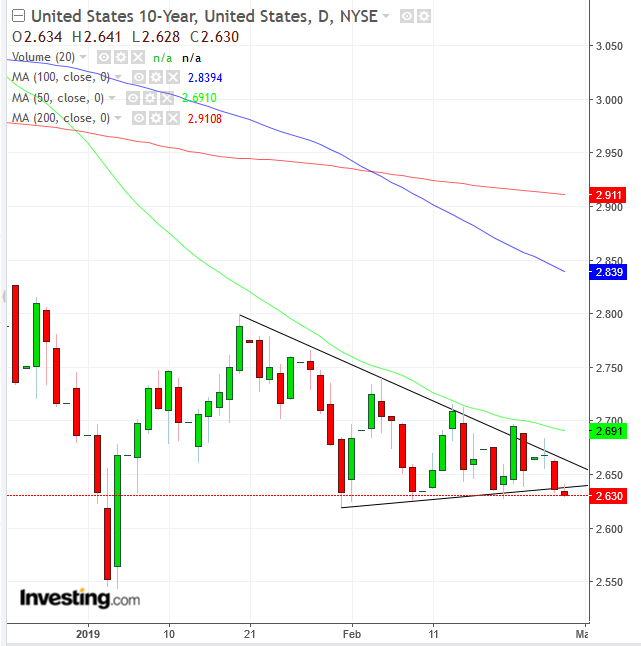 Today, yields have given up an earlier rebound and extended the fall, as well as the downside breakout. As for trading, it seems like the market was focusing on the probability of a fully-fledged policy shift from the Fed, rather than of a pause. 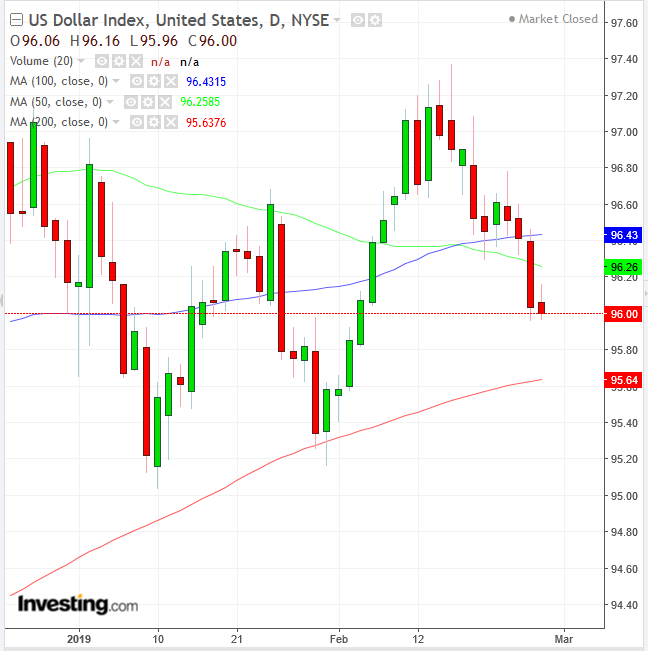 That sent the USD almost 0.4% lower, below the 50 and 100 DMAs, prompting it to fall back to the 200 DMAs presumed support within a short-term uptrend. In the commodity market, climbed, reversing a loss that had been spurred by criticism from Trump that OPEC was favoring unsustainable prices. Technically, the price jumped off the 100 DMA and the 50 DMA and is curving upward, pointing to the direction of the next expected price move. Powell delivers the second part of his semiannual testimony on monetary policy and the state of the economy to a House committee on Wednesday. Fourth quarter U.S. comes out on Thursday. The STOXX 600 dropped 0.4 percent, the largest decrease in almost three weeks. Futures on the S&P 500 fell 0.2 percent. India NSE Volatility Index surged 11.1 percent. The Dollar Index fell less than 0.05 percent. The edged less than 0.05 percent lower, the largest fall in a week. The increased 0.2 percent to $1.3275, the strongest in almost eight months. The Japanese yen gained 0.2 percent to 110.38 per dollar, the strongest in almost three weeks. The declined 0.3 percent on the biggest decrease in more than a week. The yield on 10-year Treasurys slipped one basis point to 2.63 percent, the lowest in almost four weeks. Germany’s yield slid less than one basis point to 0.11 percent. Britain’s yield climbed less than one basis point to 1.21 percent, the highest in three weeks. The fell less than 0.05 percent to 81.19.
dropped 0.7 percent to $12,875 per metric ton, the largest dip in almost two weeks. West Texas Intermediate crude rose 0.7 percent to $55.88 a barrel, the biggest advance in a week.